U.S. Sen. Bill Nelson, D-Fla., is planning to make multiple farewell speeches on the floor of the Senate to highlight the issues he hopes the nation will solve after he leaves office. Nelson took to the Senate floor on Monday to deliver the first of these speeches. In that address, he took a shot at the man who defeated him, Gov. Rick Scott, echoing a theme from the campaign trail saying “a public office is a public trust,” a clear jab at the Republican governor that the Democrat used multiple times on the campaign trail. In the coming days, Nelson plans more such speeches. While he mentioned the need for both parties to work together to solve problems, Nelson described that “public trust” in terms of policies Democrats have pushed. ”There are a lot of other things that fall under that category of public trust,” Nelson said. “You must fight to protect the fundamental right to health care and against any attempt to roll back our progress on things like preexisting conditions. Most everybody has a preexisting condition. If it’s not required that an insurance company cover you, then either your rate is prohibitively high or else you don’t get coverage at all. And out of 20 million people in the state of Florida, 8 million people have a preexisting condition. “And you must continue the fight to preserve the natural wonders of our state, from the Everglades to the pine forest, to the beaches and the offshore waters. Say no to drilling off our coast, not one rig off of our coastline not only for the sake of our environment, the sake of our tourism economy and for the sake of the largest military testing and training area for the United States military in the world right off of our coast,” Nelson added. 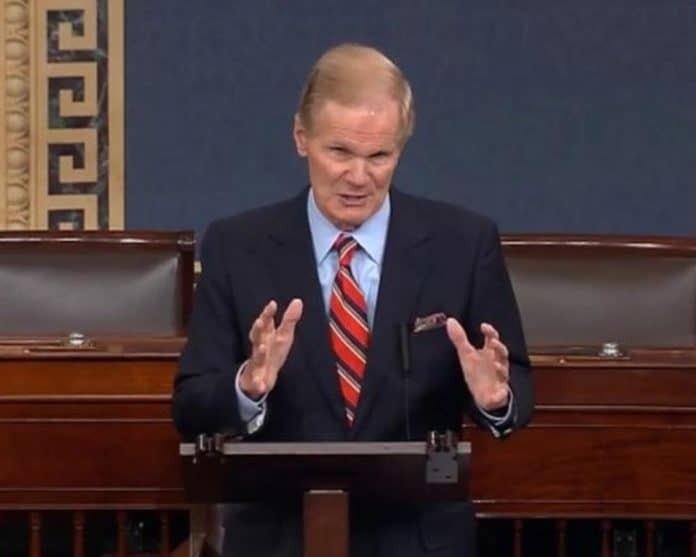 Nelson has been a fierce advocate for NASA during his tenure in the House and the Senate and continued to use the bully pulpit to lobby on that agency’s behalf, saying that we need to continue to “launch rockets and to explore the heavens.” He mentioned his travel into space but did not mention President Donald Trump’s plans to build a space force that would potentially be its own branch of the military. One of the more interesting quotes from Nelson came on the subject of rights. In the meantime, look for Nelson to continue the farewell tour in the following weeks.